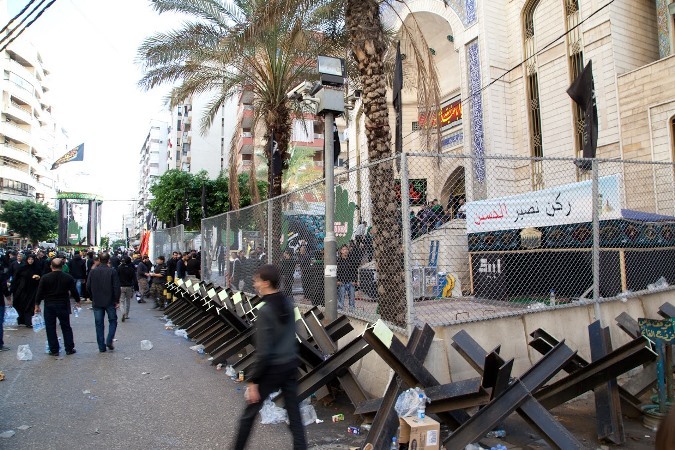 Beirut – Past the barricaded checkpoints, the searching tents, and groups of men with walkie-talkies, hundreds of thousands of Shia Muslims gathered in Beirut’s southern suburbs on Tuesday, to commemorate Ashura. On this day, Shia Muslims worldwide mourn the death of Imam Hussein, grandson of Prophet Muhammad – and in Lebanon, despite significant security threats and political deadlock, this year was no different. As rain fell on the southern suburbs of Dahiyeh, men – old and young alike – sobbed, covering their faces with their hands, while women, clad in black, squatted silently by closed-up shops. Over massive, ubiquitous speakers, a solemn voice narrated the battle of Karbala – in modern-day Iraq – where Hussein was killed. When the reader’s voice cracked into a sob, you could hear the wailing and heaving of hundreds of thousands of mourners. But once the reading was done and the march began, the commemoration’s mood drastically changed. Flags bearing Hezbollah’s logo and traditional Ashura slogans – “For you, Hussein” – mixed in with Palestinian and Lebanese flags. This confident tone bled into Nasrallah’s speech, which was broadcast to supporters via video link on Tuesday morning. In it, he boasted of his party’s victories over “extremists” in Syria, where Hezbollah has intervened on behalf of embattled President Bashar al-Assad. Nasrallah assured his audience that Hezbollah had not forsaken its mission to fight Israel and liberate Palestine. And hitting home, he promised that Hezbollah would continue its fight against takfiri groups, both in Syria and in an increasingly unstable Lebanon. Over the past 15 months, Beirut’s predominantly Shia southern suburbs have been the target of a number of car bombs, killing over 75 people and injuring hundreds. There is widespread belief among Lebanon’s Shia community that groups such as al-Qaeda-linked Jabhat al-Nusra and the Islamic State of Iraq and the Levant (ISIL), have established a foothold in the country over the past year. These groups have repeatedly threatened to attack areas perceived as Hezbollah strongholds, particularly at times of large gatherings like Ashura commemorations. This year’s events, however, went off without a hitch in Dahiyeh. Cars were banned from entering the neighbourhood, bags were thoroughly searched, and Hezbollah security members were present in large numbers. One local Hezbollah security official, who asked to remain anonymous, said that this year, security around the southern suburbs had been stricter than ever. “The threats we face this year are colossal,” he said. The security source added that the rise in sectarian tension in Tripoli, as well as Hezbollah’s clashes with al-Qaeda-linked groups along the Syrian-Lebanese border, had heightened the risk of reprisal attacks in a politically important place like Dahiyeh. But this fear didn’t seem to keep many Shia Muslims off the streets. According to many Dahiyeh residents, the more dire Lebanon’s security situation becomes, the more emboldened they feel. “Instead of scaring people away, the fear makes people come out into the streets,” said the Hezbollah official. He estimated that 600,000 to one million people had been marching through Lebanon’s southern suburbs on Tuesday. Men and women, young and old, echoed this defiance. Many specifically tied Hussein’s death by beheading at Karbala, to the decapitations committed by ISIL in Iraq, Syria, and even on the Lebanese border. “Are we any better than Hussein?” asked Rizk Obeid, an electrician and Hezbollah supporter. “I might die in an explosion plotted by the animals of Daesh [the Arabic acronym for ISIL],” said Layla, whose neighbourhood of Haret Hreik had experienced at least two explosions in the past year. “But I am here because we want to show them we are not afraid of them. We are afraid of no one but Allah,” she added. On the eve of the Ashura celebrations, Hezbollah head Nasrallah delivered an in-person speech to a roaring crowd in Beirut’s southern suburbs. Nasrallah gave a rare praise to his political rivals, the largely Sunni Future Movement, and insisted that Lebanon’s conflict, as well as several regional conflicts, should not be framed along a Sunni-Shia divide. “Nasrallah has been trying to reduce the sectarian tensions and get along with Future Movement headed by Saad al-Hariri,” said Dr Ahmed Moussalli, a political analyst and a lecturer at the American University of Beirut. Despite the conciliatory nature of the message, Moussalli said Nasrallah’s speech was coming from a position of strength – “realistic, but with a high tone”. Analysts say this most recent outreach comes in the wake of recent violence in Lebanon’s northern city of Tripoli, where al-Qaeda-linked fighters battled the Lebanese army for three days at the end of October. “Nasrallah wants the Future Movement to control the Sunni population so that extremist elements don’t take advantage of the leadership vacuum among the country’s Sunnis,” said Lebanese analyst Haytham Mouzahem. Lebanon’s political situation has been growing more tense by the day. After extending its term in May 2013 for another year and a half, the Lebanese parliament on Wednesday endorsed a second extension for two years and eight months until spring 2017. Lebanon’s two political coalitions were internally split over this decision. While both Hezbollah and the Future movement have called for an extension, their Christian coalition partners – the Free Patriotic Movement (FPM) and the Lebanese forces, respectively – have denounced the move. A last minute change saw the Lebanese forces vote in favour of the extension. “Nasrallah wanted to send a message to Lebanon’s Sunnis that his fight is not with them. It’s with the takfiris specifically,” Mouzahem added. Other political offices stand vacant as well. The president’s term expired five months ago, and Lebanon’s parties have yet to agree on a suitable consensus candidate. On November 4, Hezbollah announced the party’s endorsement for FPM leader Michel Aoun as their preferred candidate – a move that analysts say was a long time coming.